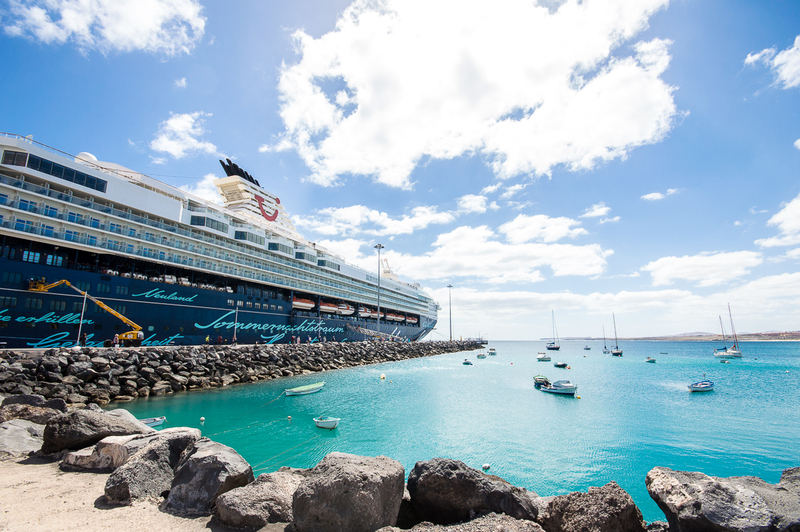 TUI Cruises offered several excursions in the morning and afternoon on Fuerteventura. 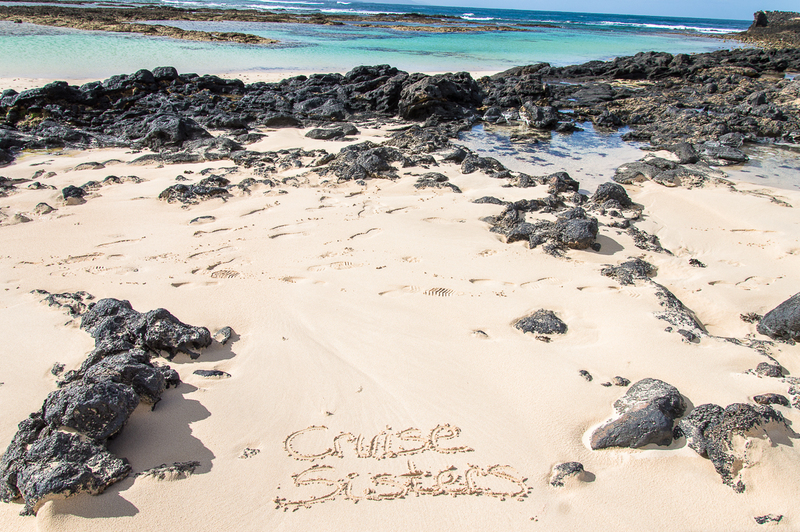 The excursions included trips over the island, beach fun, hikes or shopping tours. 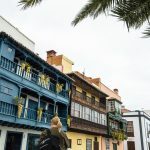 Here are a few examples: shopping in Corralejo (4 hours for 23 euros), a catamaran trip (5.5 hours for 75 euros), a trike tour (2 hours for 139 euros) , an aloe vera workshop (3 hours for 35 euros) and also a jeep tour. I decided to try the jeep tour in the morning. This trip cost 65 euros per person for four hours. 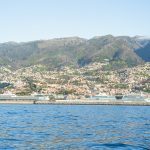 The small white beach Playa Chica is only 400 meters from the cruise port (muelle de Cruceros) and is suitable for swimming. When there is good weather you can spend a beach day here with a towel and some sunscreen. There is also a shopping mall close to the port. The mall Las Rotondas is about 1 km from the cruise port and you can walk there in about 15 minutes. The easiest way is to turn left at the end of the pier towards Av. Reyes de España. Follow this alley up to the beach until you see a roundabout. You pass over the roundabout and follow the street Calle Duero. On this street you walk straight until the mall shows up to your right. There were many nice shops and restaurants in the mall. But today I went neither to the beach nor to the shopping mall. I wanted to explore the island in a jeep. 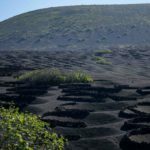 What can I expect on a Jeep Tour to the North of Fuerteventura? 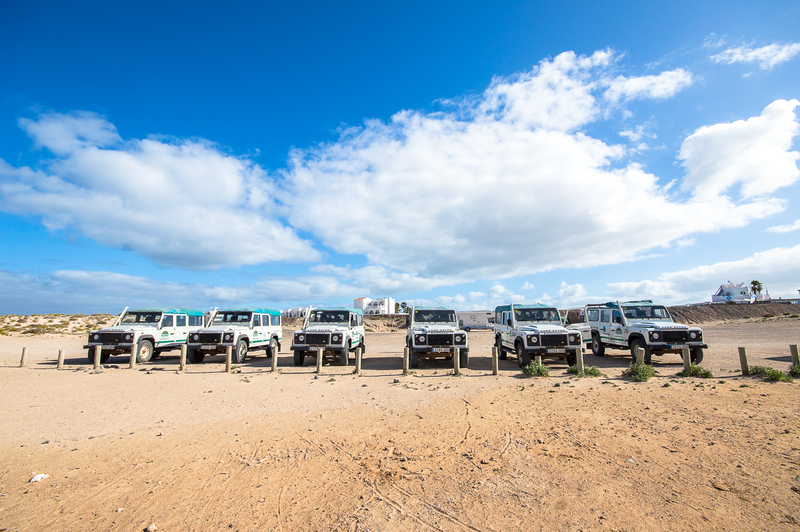 The off-road trip in the jeep to the north of Fuerteventura started early in the morning. On the excursion ticket stood the meeting point on board for the start of the excursion . So we went to the designated meeting place around 8 am. There were already many other travelers and a staff member of the excursion team. Here we were assigned to the Jeeps for the trip. There was a group of six people per Jeep. We were assigned to Jeep D.
Take a scarf and a hat or a cap with you, because it is very windy when driving, when the hood is open. Also you should not forget sun protection, with the top down you can quickly get a sunburn. Sturdy footwear or sneakers are also important in order to be able to run around in the photo stops in the area. Don’t forget sun protection. You can quickly get a sunburn. Sturdy footwear or sneakers are also important in order to be able to walk around in the area when having a photo stop. In each Land Rover sat two people in the back (on seats in the trunk), three in the back seat and a person in front next to the driver. 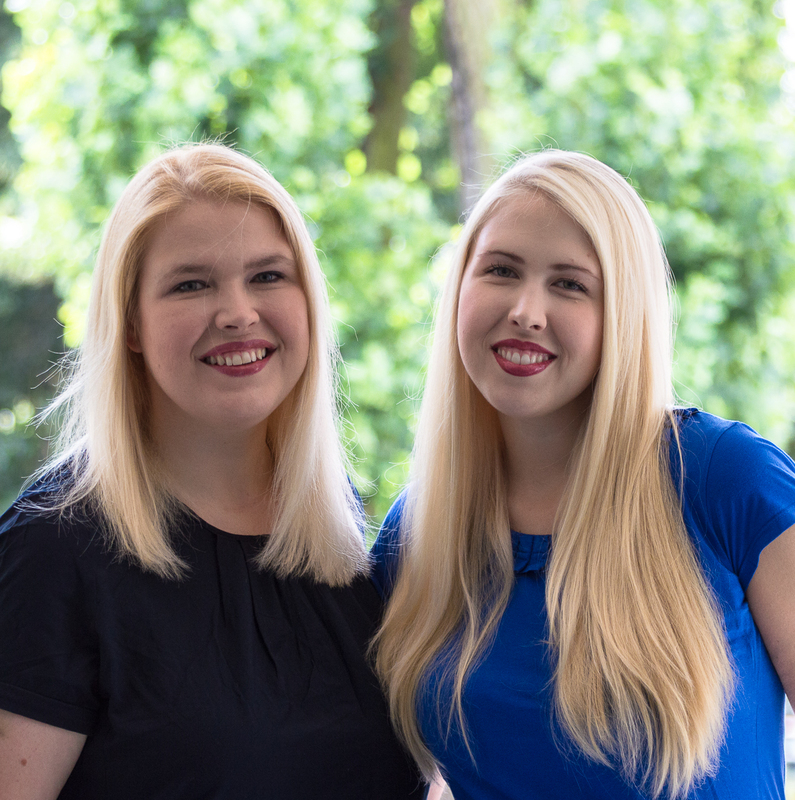 We were lucky because two people did not come, so that four of us sat comfortably in the car. Of course, you could see well from any seat. Then our trip started. Our driver only spoke Spanish and English, but there was a tour guide in one of the other Jeeps who explained everything in German at the beginning and at each stop. The Jeeps drove from the harbor area on the highway north to our first stop. 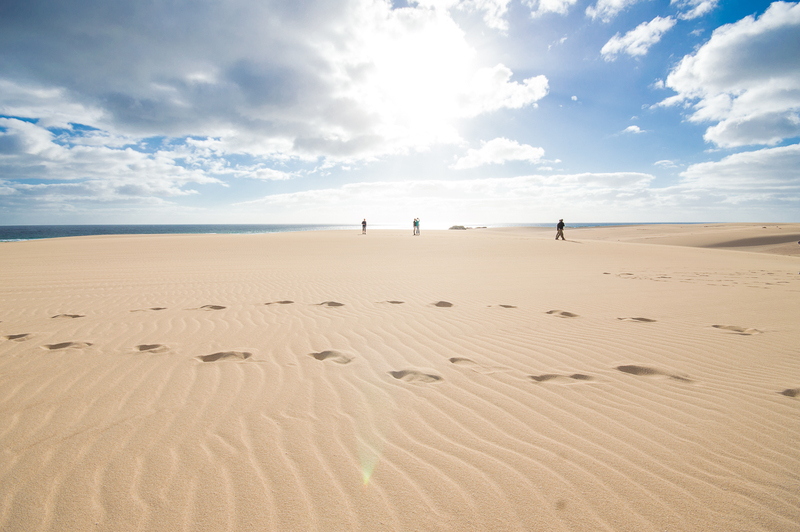 The first stop was the 20 square kilometer El Jable dune area – Las Dunas de Corralejo. It is under conservation and is constantly in motion. Our driver told us that in the morning often the roads are blown away by the sand and they have to be cleared again and again. We got out of the car and walked up the sand dunes. It was a real desert feeling. The shoes were filled with fine sand as we climbed happily up the dunes and looked out to the sea. It was so beautiful and the time flew. From here we drove off-road on the stony lava rock through the volcanic landscape of Fuerteventura and we were right in the middle of the adventure. Clouds of dust appeared on the left and right of the car as we swung up and down the uneven lava landscape at high speed. At least now I knew why the trip was not suitable for people with back problems. While the Jeeps raced over the bumpy volcanic landscape, we were shaken vigorously on our seats, but it was a lot of fun. 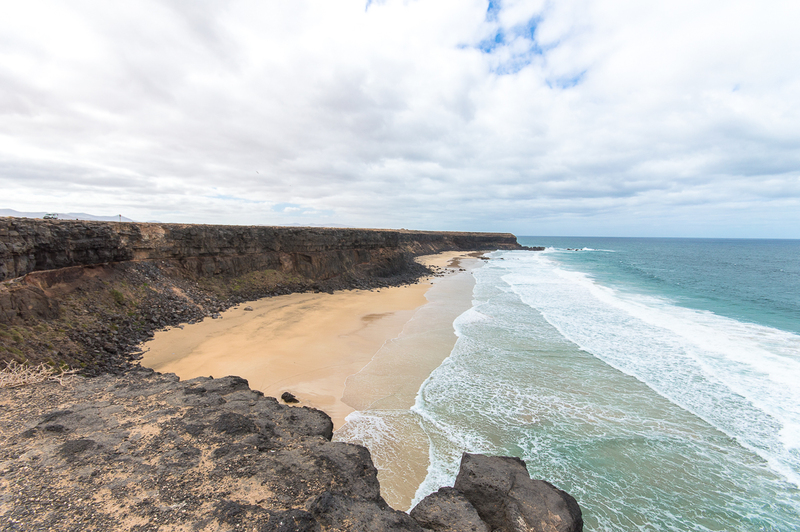 We reached the second stop: the coast of El Cotillo. Around the fishing village there were several small bays. 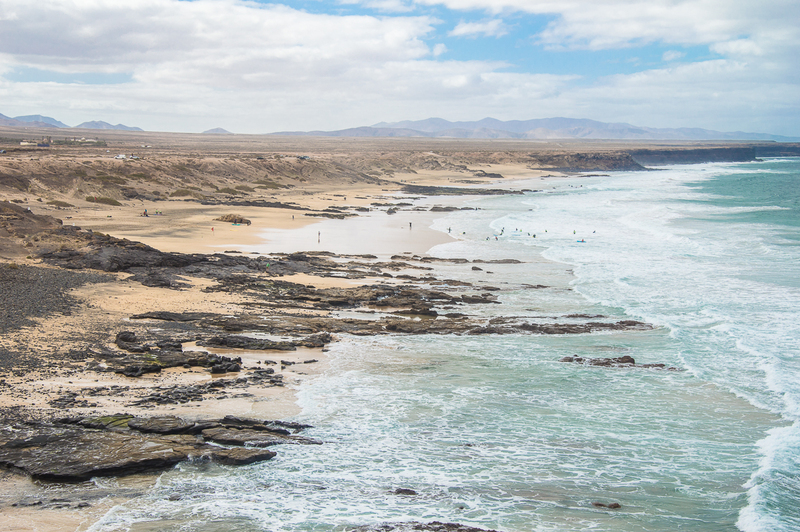 We stopped at Playa de La Concha beach, which is located in a horseshoe-shaped natural reef and is one of Fuerteventura’s most famous beaches. At this stop we had 40 minutes to walk around. There was also a small kiosk where we could buy drinks and a snack. Unfortunately it was too cold for swimming. That would have been perfect. When it is warm enough and the sun is shining, you should take bathing suits and a towel with you. Instead we went for a walk on the beach and enjoyed the time. 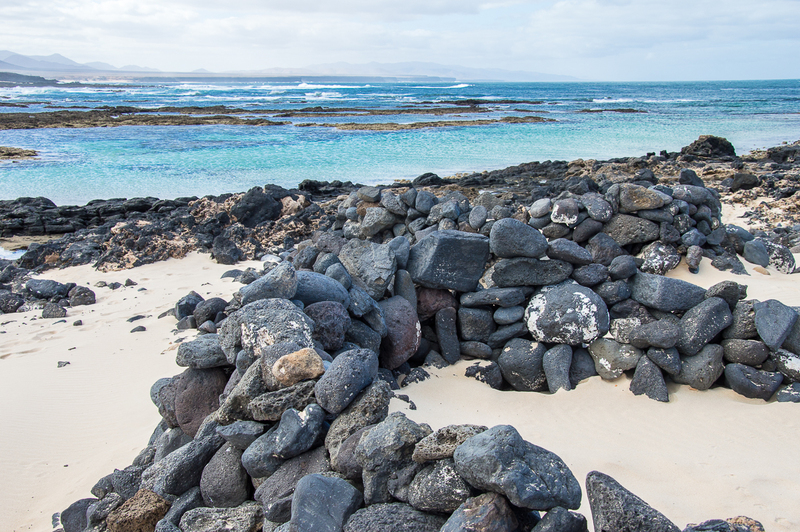 At Playa de La Concha there were many beautiful small stone walls, which were built with lava stones in the sand. Since it was very windy, we sat in one of these stone walls in the sand and were protected from the wind to enjoy the sea view. Later, we learned that these walls are called corralito and were created by the residents to do just that: protect themselves from the wind and to relax. Then we drove to El Testón. On the way we passed a small whale skeleton. 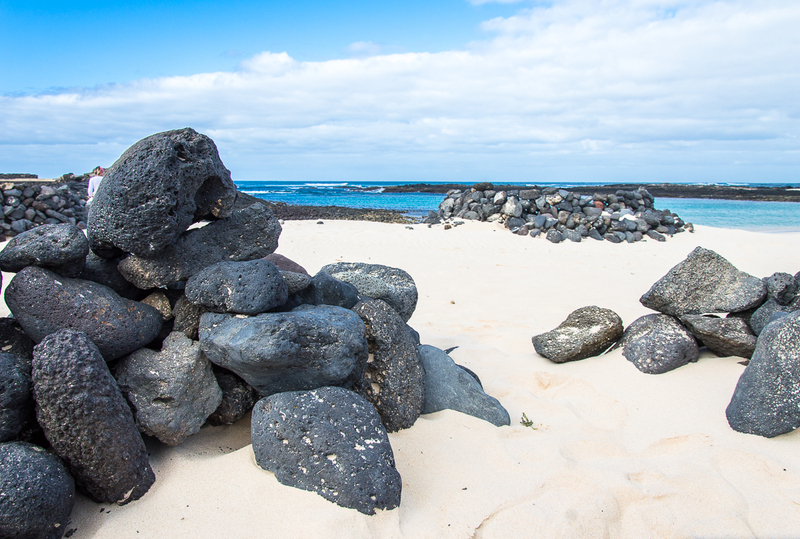 It is part of the project “Senda de los Cetáceos” (“The Path of the Sea Mammals”), in which the island administration issues skeletons of marine mammals all over the coast of Fuerteventura. 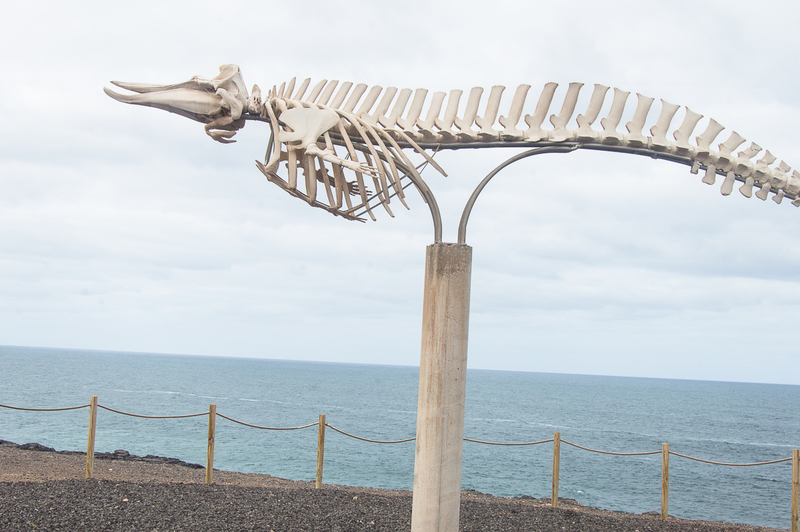 Our driver told us that the whale skeleton in El Cotillo is a six-meter skeleton of a Cuvier’s beaked whale. We only looked at it when driving by and were very impressed. Then we continued along the northwest coast until we stopped on the cliffs overlooking the beaches Esquinzo and Águila. The big waves in these huge bays with a sandy beach are incredibly impressive and we quickly got an idea of why this area is so popular for surfing. Next we stopped at the bar Maria in Tindaya with a view of the mountain Tindaya. 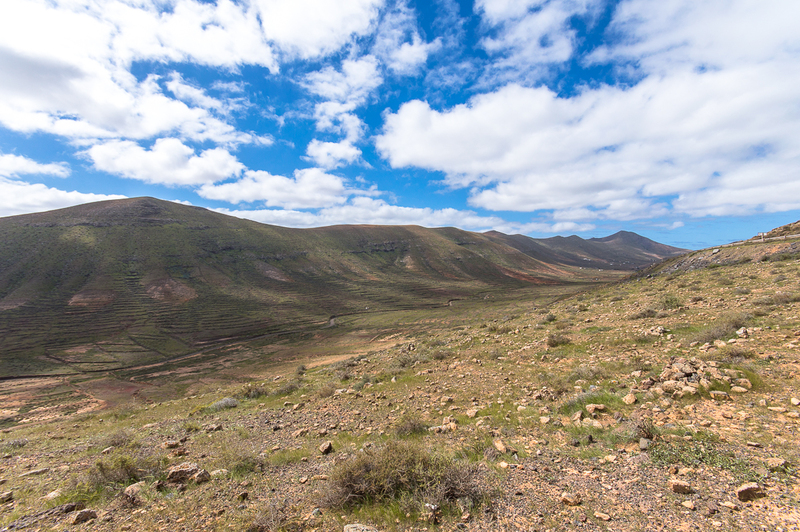 The Montaña de Tindaya is a sacred mountain and one of the natural monuments of Fuerteventura. 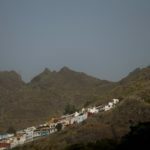 It lies in the middle of a nature reserve and the travel guide told us that several myths entwine themselves around the mountain. The bar is rather unspectacular, but there is a really good coffee we drank while standing at the counter and in front of the bar we were able to take some pictures of the mountain. A little refreshment and a nice photo. That was a nice stop, but certainly not the best part of the tour. For our last stop we drove to a view point on the Vallebrón mountains. Here we had a sensational view of the valleys of the mountains. It was a great stop to enjoy the view. 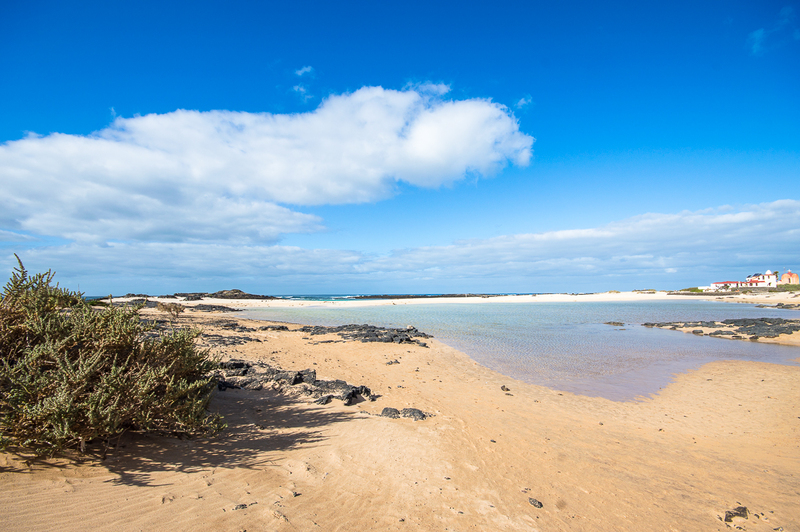 On this trip we got a wonderful impression of the island Fuerteventura. Here, all the drivers said goodbye to us, before driving us back over the volcanic slopes towards the harbor. 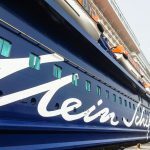 Arrived at the harbor the Mein Schiff 2 welcomed us in bright sunshine, lying in the turquoise water. Overall, the trip was really worth it. 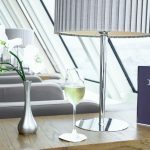 We’ve seen a lot of Fuerteventura’s north and the trip took only 4 hours, so there was plenty of time to spend an afternoon in the sun on board the cruise ship.